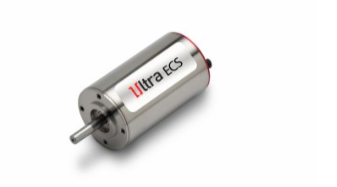 Portescap is expanding the Ultra EC range of brushless DC slotless motors with the introduction of the 35ECS. This 2 pole unit offers up to 330W, max continuous. It is available in two lengths: the 35ECS60 and the 35ECS80. They feature the patented Ultra EC coil technology which provides limited core losses over a wide range of working speeds without friction and brush wear. These motors feature a high-speed rotor design to sustain speeds up to 40,000 rpm. The 35ECS80 opens new areas for slim/long packaging, while the 35ECS60 allows high speed capabilities at very low voltages. The new 35ECSs are for applications such as battery-operated hand tools (industrial tightening devices or drills), factory automation equipment (large fans or vacuum pumps), and also for applications where there are constraints on diameter. They feature a laser welded front flange to ensure the strongest housing to sustain high torque reaction. A temperature probe on the coil head ensures an optimised control of motor performances in heavy duty applications. These motors are offered with Hall sensors and a total of 6 different coils to match speed and voltage requirements.